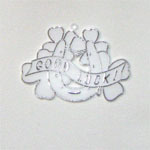 Load up on Good Luck with the Good luck Horseshow and Clover charm. This one is pretty large so plan accordingly. 12 per pack.